China has been the largest consuming country for ICs since 2005, but large increases in IC production within China have not immediately followed, according to data presented in the new 500-page 2019 edition of IC Insights’ McClean Report—A Complete Analysis and Forecast of the Integrated Circuit Industry(released in January 2019). 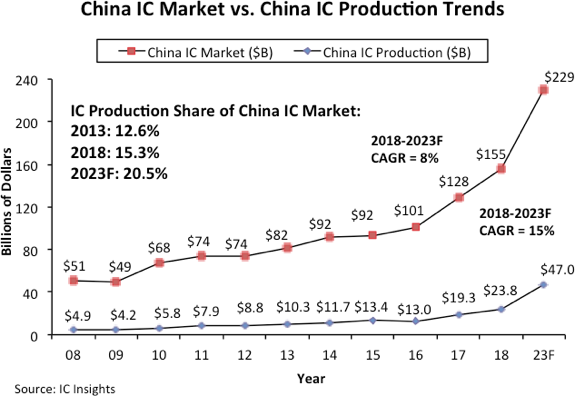 As shown in Figure 1, IC production in China represented 15.3% of its $155 billion IC market in 2018, up from 12.6% five years earlier in 2013. Moreover, IC Insights forecasts that this share will increase by 5.2 percentage points from 2018 to 20.5% in 2023. Additional details on China’s IC market and other trends within the IC industry are included in the 2019 edition of The McClean Report—A Complete Analysis and Forecast of the Integrated Circuit Industry, which was released in January 2019. A subscription to The McClean Report includes free monthly updates from March through November (including a 200+ page Mid-Year Update), and free access to subscriber-only webinars throughout the year. An individual user license to the 2019 edition of The McClean Report is priced at $4,990 and includes an Internet access password. A multi-user worldwide corporate license is available for $7,990.